Logitech has long made a thin keyboard bolt-on case come accessory for the regular iPad, but can the same concept work for the iPad mini? We found out with the latest offering from the mouse and keyboard maker. Like the iPad Ultrathin Keyboard cover, the iPad mini version magnetically suckers itself to the left had edge of your iPad mini - it's the same way Apple's Smart Cover attaches itself. That means your screen is protected, but sadly not the back - you'll need Logitech's newer Folio keyboard case if you want that option. The keyboard itself is about the same thickness as the mini, giving good design symmetry to the experience and means that like the name suggests it still leaves you with an "ultrathin" product at the end of it. The magnet could have been a lot stronger; a bit of a wiggle and your iPad mini will fall off, but the brushed metal finish matches the aesthetics of Apple's design nicely. Logitech has packed in a full QWERTY keyboard into the design that measures 20cm across. Compared to a full-size standard QWERTY keyboard on a MacBook Air, for example, and you get 7cm less space, but virtually the same number of keys. In practice that means typing is a tight experience and one where you have to be as nimble as possible, especially if you are tying with the keyboard on your lap. You can do that because the Logitech Ultrathin Keyboard Cover for iPad Mini has a groove just above the keys that you sit the iPad mini in and that positions the mini at the right angle to be able to work at. For the first couple of days we found our typing slightly offset. There are raised markers on the F and J keys for touch typists, but we think it is more to do with the fact that the keyboard stretches beyond the screen area. After our initial fumble practice made perfect. The keys themselves aren't minuscule, they just aren't that big, but Logitech has still managed to feature the four arrow keys, and a series of secondary keys accessed via a function (fn) key. Here you get Lock screen, Siri access, Search, Browser, the ability to toggle on the on-screen keyboard, Photos, Media playback buttons, and volume control. On the side of the keyboard there is a power switch and a Bluetooth key to start the pairing sequence with your iPad mini the first time. The keys have good "travel", good resonance, and good "clickability". 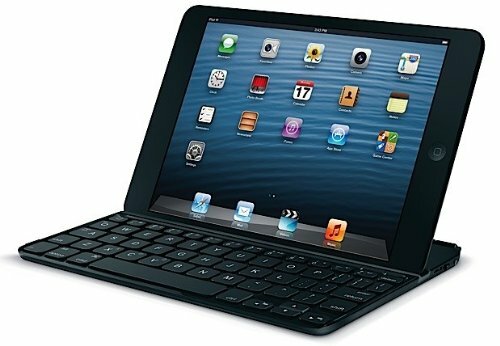 As long as you get the right key you'll be happy typing on the Logitech Ultrathin Keyboard Cover for iPad Mini. Logitech promise a 6-month battery life from a single charge of the built battery and while we've not been using it for 6 months yet, in the past month we have, we've not had an issue with the battery. The keyboard pairs instantly every time and is quick and responsive whenever we've gone to use it. If you need to do a lot of typing on the go from your iPad then this certainly offers you the ability to just that. It is quicker than typing on screen, once you've got used to the smaller keyboard, and does mean you'll be able to get that document written or those longer emails bashed out quickly. There are faults, the magnets could be stronger and there is no protection for the rear of your tablet, but on the whole it is worth using. In fact, by adding the keyboard to the iPad mini, this is the nearest yet to making this work in a similar way to a netbook, but with the added touchscreen experience than Apple said we wouldn't want to do.